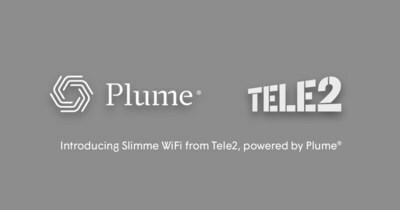 DIEMEN, Netherlands, Feb. 5, 2019 /PRNewswire/ -- Plume®, the Silicon Valley based creator of Adaptive WiFi™, announced the availability of its smart home services bundle in the Netherlands through Tele2, a leading telecom operator. Designed to address a number of pain points including inconsistent Wi-Fi coverage and performance, Plume learns the needs of the home to make Wi-Fi faster, safer and more reliable. Plume memberships are available to all Tele2 internet subscribers for €5.00 per month. The service bundle, called "Slimme WiFi," includes Adaptive WiFi™, HomePass®, advanced parental controls, the Plume app and a 3-pack of Plume Pods. Customers must have a Tele2 internet subscription to add Plume. For more information, visit https://www.tele2.nl/thuis/internet/slimme-wifi. Poor Wi-Fi signals, dropped mobile phone calls and buffering video are now a thing of the past as Plume constantly analyses and adapts to every member's unique environment. Adaptive WiFiTM fills the entire home with the strongest possible signal and ensures that users receive the most reliable and consistent home Wi-Fi experience on any device. HomePass® guest access allows members to personalise who gets onto their Wi-Fi networks, for how long, and what they can do. Advanced parental controls offer further personalisation, enabling parents to precisely control when and what services their children have access to. The ability to freeze Internet, block access to adult sites, or set access schedules makes for ultimate peace of mind. The elegantly designed Plume Pods plug directly into regular wall mounted power sockets, can be set up in only minutes using the Plume app for AndroidTM and iOS and extend smart and fast Wi-Fi to every corner of the home. "Tele2 is dedicated to providing our customers with the most innovative, easy-to-use technology at the most reasonable price," said Job Schut, Head of Consumer Fixed of Tele2. "We are thrilled to partner up with Plume, through their integrated and managed Adaptive WiFi™ solution that offers the control, personalisation and exceptional user experience that Plume delivers." "We are thrilled to bring Plume to the Netherlands first with Tele2," said Sri Nathan, co-founder and Head of Business Development of Plume. "With the ever-expanding number of in-home smart devices, wall-to-wall connectivity, reliability and security are must haves. Tele2 subscribers are the big winners in this first-to-market initiative in the Netherlands." Plume is the pioneer of Adaptive WiFi™, the world's first self-optimizing Wi-Fi delivering reliable and consistent Internet experience to every corner of the home, and the original designer and inventor of Wi-Fi Pods and SuperPods. Plume is driven by the Plume Cloud, a powerful cloud-based control plane, enabling the most advanced, resilient home Wi-Fi solution due to its ability to dynamically adapt and respond to changing network loads and interference. An open source common software, OpenSync™ can be integrated into third party hardware for connection to the Plume Cloud. Plume's cognitive service curation platform enables a rich set of modern consumer services for the home which can run-on third-party hardware platforms and be deployed at massive scale. Visit www.plume.com and www.platform.plume.com. Tele2 is one of Europe's leading telecom operators, offering mobile communication services, fixed broadband and telephony, data network services and content services. Tele2 is convinced that telecom can be done differently. Better. Easier. And cheaper. By continuing to improve on what people have come to consider as being 'ordinary'. By always being there for their customers. Tele2 is going even further in order to become the very best telecom provider in the Netherlands. That's why Tele2 customers can benefit from top quality services that are user-friendly and affordable. Visit https://www.tele2.nl/. Plume, SuperPod, Adaptive WiFi, and HomePass are trademarks of Plume Design, Inc.